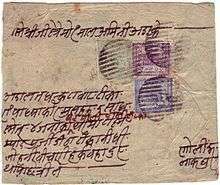 The first stamps of Nepal on cover, 1881. ↑ Introduction of Postal Service Nepal Post, 2012. Retrieved 30 September 2013. Archived here. ↑ Nepal EMS, Universal Postal Union, 2013. Retrieved 30 September 2013. Wikimedia Commons has media related to Stamps of Nepal.